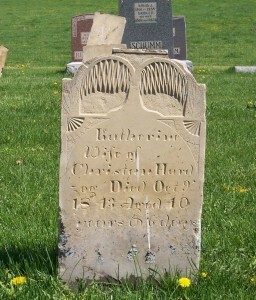 Katherine Hardzog, Zion Lutheran Cemetery, Schumm, Van Wert County, Ohio. Katherine’s tombstone stands next to Caroline Hardzog’s tombstone, the young child’s marker featured in last week’s Tombstone Tuesday. Katherine was likely Caroline’s mother. Their markers indicate that Christian Hardzog was Katherine’s husband as well as Caroline’s father. As was the case with Caroline, Katherine died before Zion Lutheran Schumm began keeping records. In fact they both died before Zion was even an established church. As a result there are no records of Katherine’s death at Zion. It appears that the same engraver inscribed both Katherine and Caroline’s tombstones. He had a way of breaking up names or words and continuing them on the next line, without a hyphen. This is a nice sandstone marker with a weeping willow motif at the top. The weeping willow signifies mourning and sorrow. The willow tree was one of the first funerary motifs to replace the death head and soul effigy, both popular during the colonial period. There are no records of Andrew Kallenberger’s first wife’s grave that I have been able to locate. It seems odd that she is not in the Chatt cemetery. Her death should have come after both Chatt and Schumm churches were well established, yet I have seen no references. Have you come across anything that would suggest where she was buried? Before you expend any real effort on this, note that I have only been modestly active in searching myself and have not really pursued some rather simple online resources, so I am not asking you to expend time and effort, only to share anything that might have come up in your other searches. Your current topic has led me to wonder if I should walk through the Schumm cemetery and check out the markers, though I might have some trouble even finding it. We were at the church some years ago for Scott Luginbill’s wedding, but not sure I could find my way back. Guess age is destroying what few brain cells I still have active. I would imagine that she was buried and Zion Chatt since the church records record her death and burial. Some burials were recorded in our records and then buried in Kessler/Liberty Cemetery, but there is no record of her tombstone there either. Perhaps her tombstone is broken ans has been discarded or is broken and covered with dirt.